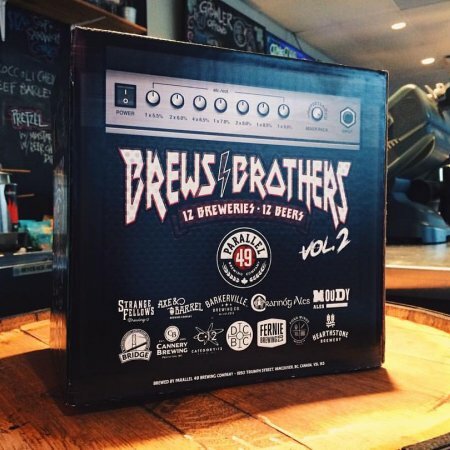 VANCOUVER, BC – Parallel 49 Brewing has announce the release of Brews Brothers Vol. 2, a mixed 12-pack featuring beers brewed in collaboration with a dozen different British Columbia craft breweries. A sequel to a similar package released last spring, this year’s edition includes collaborations with Strange Fellows Brewing, Axe & Barrel Brewing, Barkerville Brewing, Crannog Ales, Moody Ales, Bridge Brewing, Cannery Brewing, Category 12 Brewing, Doan’s Craft Brewing, Fernie Brewing, Four Winds Brewing and Hearthstone Brewery. Brews Brothers Vol. 2 is available now at the Parallel 49 retail store, and will be in stock at select liquor stores in British Columbia starting April 1st. A release party will be taking place on Sunday April 3rd at Venue (881 Granville Street, Vancouver), featuring live rock karaoke and a chance to try all 12 beers, with proceeds going to benefit Cystic Fibrosis Canada. For more details, see the Facebook event page.